Exploring the wonderful world of mincemeat. Thinking of creating an Italian mincemeat with amaretto and some similar flavours to panettones. I have called this the American version because it has whisky, fresh cranberries and pecans and maple syrup. Meanwhile, I have called this the American version because it has whisky, fresh cranberries and pecans and maple syrup. In a large bowl mix well all the ingredient except the brandy together. Leave the mixture to settle in covered and in a cool place for about 12 hours. 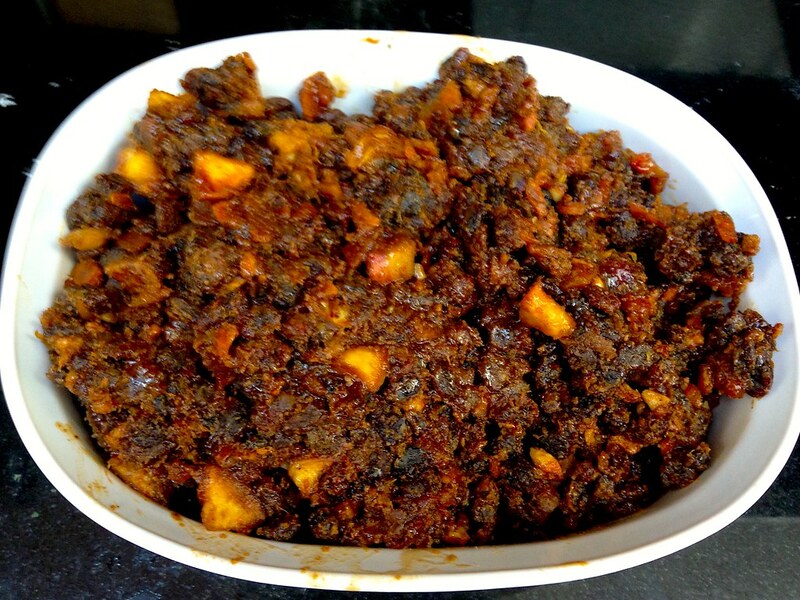 Heat the oven to 200ºC and put in your mincemeat mixture in an oven proof pan and leave in the oven 3.5 hours. It really doesn’t look pretty when it comes out but it does taste and smell delicious I promise. Leave to cool mixing it once in a while. Once cool add the brandy and mix it well. Sterilize some jars by washing them thoroughly and putting them in the oven at 180ºC for at least 5 min. Put your mincemeat in the sterilised jars. Leave in a dark cool cupboard until you need it. No knead rosemary polenta bread. 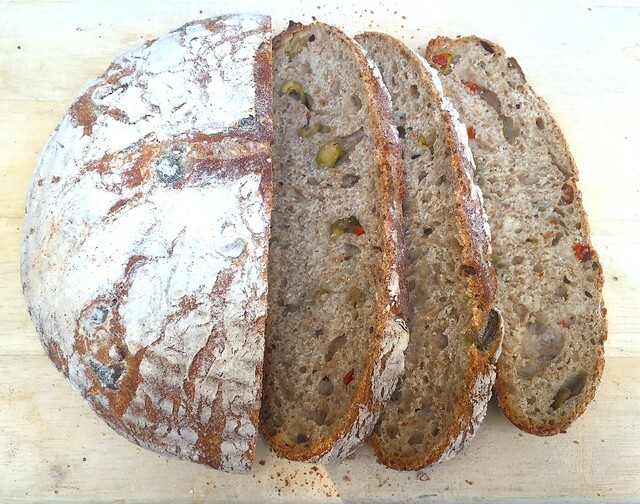 Are baker percentage intrinsic to baking bread? No, but they are great if you want to quickly and precisely calculate batches and ingredients. There is a really long discussion with lots of comment on the fresh loaf about this (it does get wonky and even a little snippy). The weekend bakery also has a dough calculator to make it easy for you. I found that for the best hydration ration is around 50%-60%. Over 60% the boule doesn’t keep its shape is more ciabatta. Under 55% you don’t really get an\y nice bubbly holes. It is easy too quickly draw up a table and easy to set up on an excel workbook. Anyways you don’t have to use it but it is a helpful tool for bread making and general baking because both rely so much on precise ratios. My two favourite things about Christmas are crackers and mince pie. During the festive season, I can be seen scouring mince pies across London to find the best. This year I have decided to up my game and do my own. 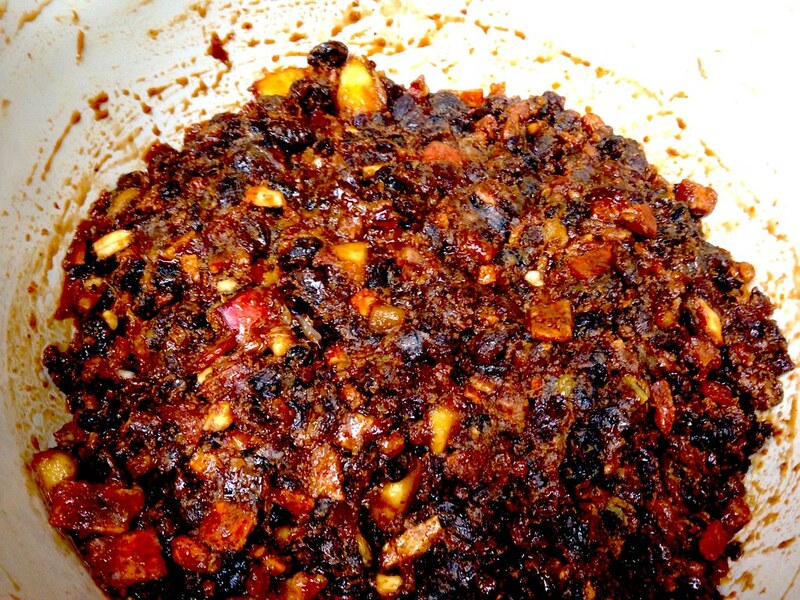 The first step towards this exciting endeavour is making mincemeat. I think the very traditional and origins of this recipe did use actual meat but most modern recipes do without it. It does use beef tallow known a suet, for vegetarians there is vegetarian suet. You can use the mincemeat right away for pies but I am going to try to wait a couple of weeks to let it really steep. My base recipe was Delia’s excellent homemade Christmas mincemeat. I added dates and cranberries. I also put slightly less suet and sugar. The candy peels are the ones that I made over the summer the recipe can be found here. I am going to try to do variations by substituting brandy with calvados or whisky. 2. Leave the mixture to settle in covered and in a cool place for about 12 hours. 3. Heat the oven to 200ºC and put in your mincemeat mixture in an oven proof pan and leave in the oven 3.5 hours. It really doesn’t look pretty when it comes out but it does taste and smell delicious I promise. 4. Leave to cool mixing it once in a while. 5. Once cool add the brandy and mix it well. 6. Sterilize some jars by washing them thoroughly and putting them in the oven at 180ºC for at least 5 min. 7. Put your mincemeat in the sterilised jars. Leave in a dark cool cupboard until you need it. Sorry, have not been baking any bread, been a bit on a summer break. The starter has been the fridge and sleeping for the last month. An excellent way to store your starter is to feed it well with flour and water give it a stir. Leave it a couple of hours at room temperature before putting in the fridge. Your starter should be fine for at least a week. I have left very well feed starter in the fridge for 3 weeks. If you are planning not to bake for a really really really long time you can also freeze it. Just put the starter in a jar and in the freezer. I have some emergency starter in the freezer at all time in case the worst should happen. 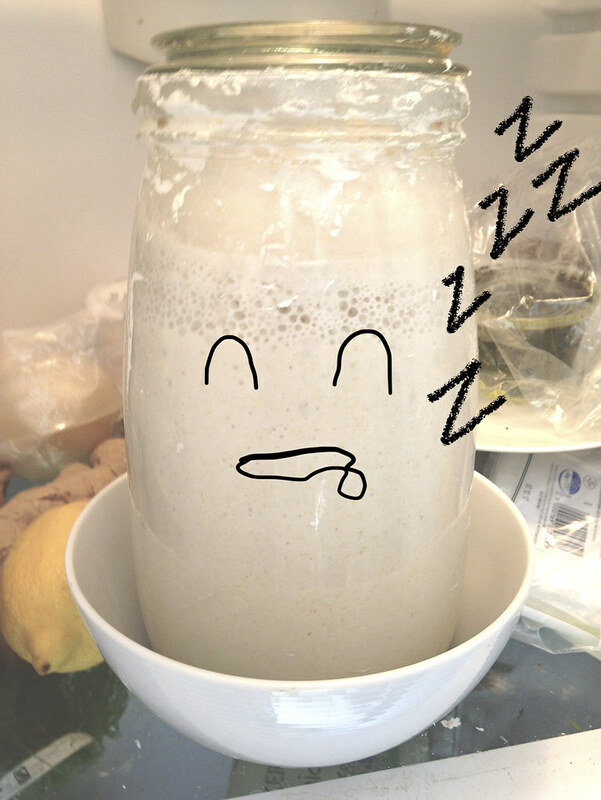 To restart your starter from the freezer, it takes a little coaxing to wake up. Leave it to thaw and then feed it well. Anyways will be back soon though! 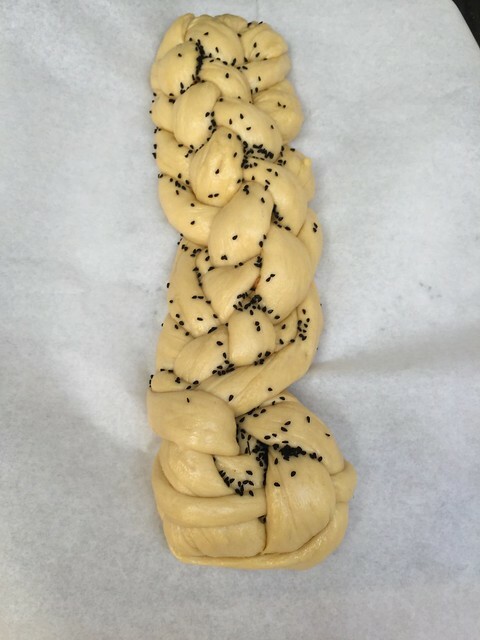 This is a bit of a through back to last year when I did challah. it was interesting…. the shape had not kept. It was a tasty blob. Dare I say I think my bread skills has been improving since I started this blog. Challah has such a deep history that I absolutely love and there is so much variation to the recipe. Safron and other spices can be found in some parts of the world. Not being part of that faith of tradition I still love it. This recipe is quirky as it uses coconut oil, whereas vegetable or olive oil would be more the traditional oils you would find. I love coconut oil vs other types of oil in the kitchen. It has a great advantage over other oils like a high smoke point. For example again super not tradition but for Yorkshire it is amazing. In my Christmas dinner taste test it won against olive and vegetable oil. Another slightly atypical ingredient is sugar. 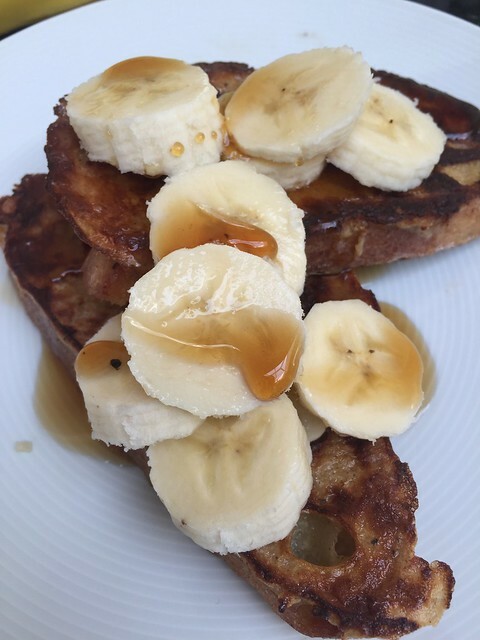 I think it is more traditional to just use honey. The only reason I have used sugar is that I now have loads of citrus sugar from doing candied sugar. It is really lovely as small little pieces of candied citrus chunks that sometimes pops up in the challah. I like having challah for breakfast which again ignores its history totally of being a Jewish holiday bread which absolutely intricate to the ceremony of it which really amazing. I love the dictum set to how to cook and company and you can find loads of article on that. It is very much the simpler less gourmandise version of brioche. I love brioche but it can somewhat rich if you are having for breakfast, a bit too much a sugary treat to start your day. This makes quite a big braided chunk which can be made into delicious french toast. 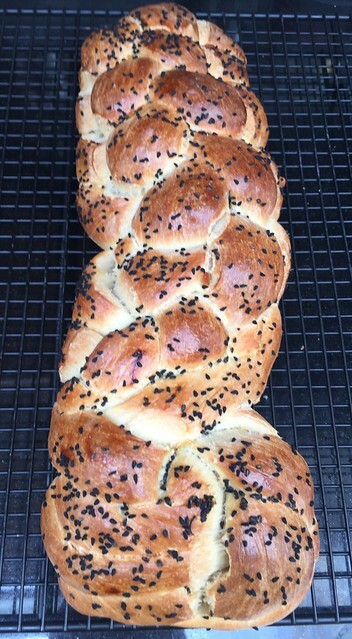 I pretty much got my recipe from Bk17 Bakery’s challah recipe. The recipe also gives you the option of adding a tahini filling which looks amazing. 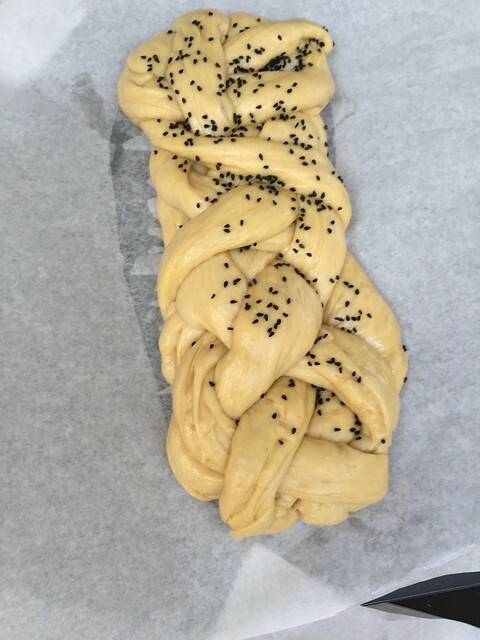 There is also challah chocolate tahini recipe from 600 acres, which again looks amazing. Traditional middle east spices like cardamon and saffron can also be added. 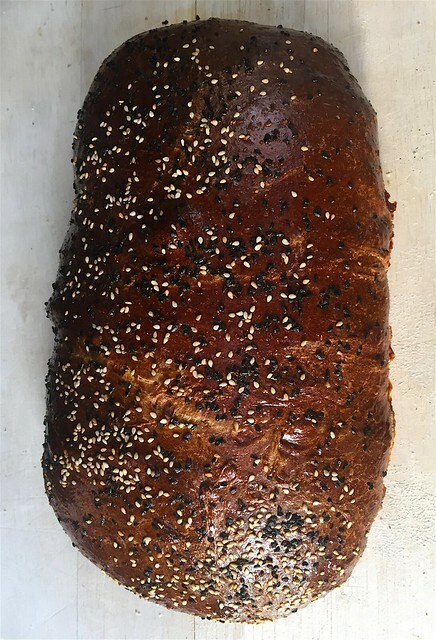 Sourdough home also has an excellent recipe post on sourdough challah with a bit of way traditional challah can’t use milk and a bit more what is kosher which is really interesting. For the ever important braiding, there are loads of youtube tutorials. There is even one with colour coded strands. Troubleshooting tip- hydration matters. Don’t use flour on your surface when you are braiding as this will dry out the dough too much. If your dough is too dry the braids will crack. If it is too wet it won’t keep it shapes. Quick note – your starter should have been feed around 4-6 hour prior and should be really active and bubbly. In a large bowl mix well starter + water + honey + sugar +oil +eggs + salt. slowly + flour until a sticky wet ball of dough is formed. knead in the bowl for about 5 min, it should be a smoother ball of dough. Lightly oil the ball of dough in the bowl. Proof until the dough doubles in sizes, about 6 hours. Now the tricky, choose how many strands you want. I like having 6 braid challah. So separate your dough into 6 equal parts. Form a strand by rolling with your hand. The thinner it is the longer your challah will be and make sure that they are all uniform. Once you have 6 strands braid them. Place the uncooked challah on a cooking tray for the final proof, about 1 hour. prepare your egg wash by combining +yolk+water+honey. and gently brush the egg wash on. Cook for 35-40min until the top of the challah is a deep brown. 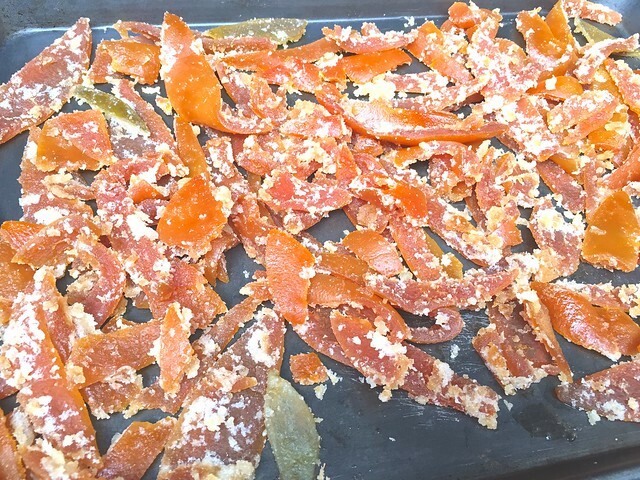 In an effort to throw out less food, found out that a great use for peels is to candy them (and save a massive amount of money cause candied citrus peel are EX-PEN-SIVE). You can also use them for tea, meat dishes and infuse liquor. They also keep very well in the freezer. I have been saving citrus peels in a freezer bag over the months. Never throw out your citrus peels. I also have been freezing some cut ginger strips to use in curry recipes and co, and decided to candy that as well. Went a bit candy mad. 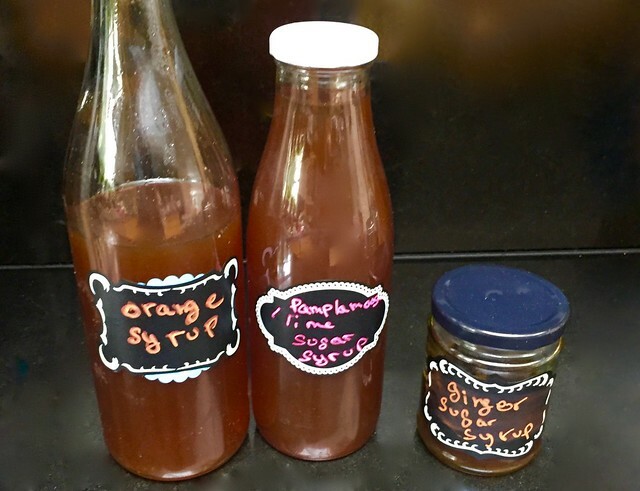 you actually get three things for the price as well – candied peels, sugar syrup and citrus sugar. Lesson learned – I think it does need a bit of forethought to what you are planning to do with them so you can cut them to the appropriate size. For example, thin strips if you want to make chocolate candied orange strips or add them to cakes. I had mix use for this one and just left it in big strips. Although I wish I had cut them into smaller thinner strips, I have a feeling it would have been quicker and easier to candy. Some of it is going to go to friends and family but my main reason was for mince meat for the Christmas mince pie. You can never prepare too soon for mince pie season as the longer you leave the mincemeat to soak up that brandy goodness the better it is apparently. In terms of cooking, I think I wider is better than a deeper pan to candy the peels in. Another great product that you get from candying your citrus is sugar syrup which is great for cocktails. Another note – I tend to use natural cane, not white sugar. So in this case (cane caster and damara) did slightly affect the colour of the syrup making it brownish. The candied fruits also look like they’ve been a bit too long in the sun and have a nice deep tan. I think to get a bit of nicer colour, especially for the sugar syrup, use white sugars. The basic idea is super simple. The basic premise is boiling the peels in 1 part sugar 1 part water. Some other variation to try for next time is adding different flavour components. For example, The Telegraph adds black peppercorn and cardamons. Will dig out my flavour thesaurus next time and see how I can spice it up (that’s right spice it up! get it?). All your peels in a pot boiling water for 10 minutes. Bring 4 cups damara sugar and 4 cups water and bring up to boil. It should just cover the peels so add less/more of water/sugar depending on how much you have. while stirring to dissolve sugar. + peel. Return to boil. 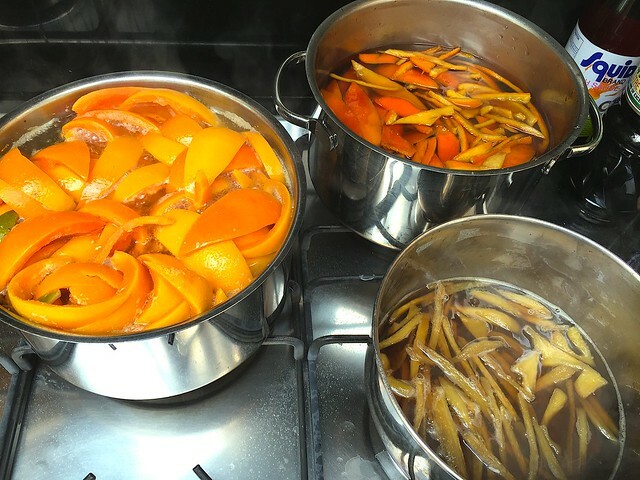 Reduce heat to a simmer and cook peels until very soft turning slightly translucent. For me, that was about 1 hour. Do not stir! it will crystallise your sugar syrup. Instead, move the pan in a circular motion. Drain peels saving that delicious sugar syrup. Let the peels cool a little and then toss peels in some sugar. Put some caster sugar on a baking sheet and transfer the peels on to the baking sheet. Drizzle some more sugar on the peels. Leave the peel to further air dry for 1 day to 2 days. So that the sugar crystallises Swat anybody trying to eat them.